The Digital Research Library of Illinois History Journal™: The Monk and the Earthquake at Cahokia's Monk's Mound in the Illinois Territory, 1811-1812. 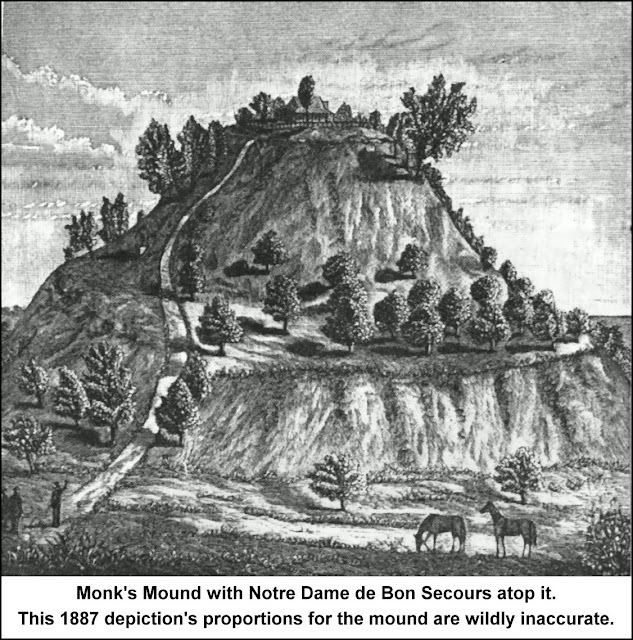 The Monk and the Earthquake at Cahokia's Monk's Mound in the Illinois Territory, 1811-1812. The story of Father Urban Guillet in the Illinois Territory started when his group of Trappists left Kentucky to move further west in 1809. Having been unsuccessful in establishing a self-sufficient community near Bardstown, Kentucky, they received an offer of land and buildings in Florissant, Missouri by John Mullanphy. Mullanphy was an Irish immigrant and a successful St. Louis entrepreneur and philanthropist. In the meantime, the superior of the Trappists received another offer of land, this time from prominent Cahokia citizen Nicholas Jarrot. Jarrot offered 400 acres of land, situated nine miles north of Cahokia, completely free of charge. The Trappists took Jarrot's offer and began to establish their settlement at the foot of the long abandoned pre-Columbian temple mound of the Mississippian culture. It was this settlement that led to the site's current nickname, Monk's Mound. 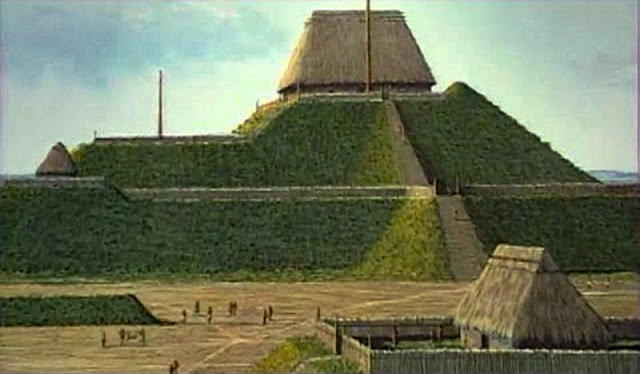 north of Mexico are preserved at Cahokia Mounds. Although Guillet and his colleagues established farms, built buildings, and opened a school for boys, the monastery of Notre Dame de Bon Secours (as they called it) never flourished. Bad weather, recurrent waves of disease, and crop failures made the Trappist ideal of a self-sufficient community difficult to pursue. Unclear title to the land, furthermore, led to problems with squatters. It seemed clear that the effort to establish a community of self-sustaining religious brothers at the foot of Monk's Mound would not succeed." It was amidst this backdrop of struggle, on December 16, 1811, that the earth shook and perhaps, for Guillet and his confreres, served as another signal of the fate of their errand into the wilderness. Fr. Guillet corresponded regularly with Jean-Octave Plessis, the Bishop of Quebec. While not his superior in the Trappist order, Plessis was an important figure in French-speaking North America and Guillet sought his counsel and assistance. Two of these letters, written on February 18, 1812 and March 14, 1812, discuss the terrifying events surrounding the earthquake that would come to be known as the New Madrid Earthquake of 1811-1812. The earthquake that Guillet was describing did indeed begin on the morning of December 16, 1811. A series of three earthquakes, measuring between 7 and 7.5 on the Richter scale, shook the entire eastern portion of the United States. Centered in northeastern Arkansas and southeastern Missouri, these earthquakes caused damage and fear over half a continent. Another significant earthquake occurred on February 7, 1812, destroying the town of New Madrid, Missouri and toppling buildings in St. Louis. In his March 14, 1812 letter to Plessis, Guillet again describes the destruction in the wake of the earthquakes. He writes that the damage locally was minor, but that he was nearly crushed by a falling chimney." He mentions the destruction of New Madrid and relates a story about the supposed source of the earthquakes: a volcanic eruption in North Carolina. This story, while likely credible, passed through many hands before it got to Guillet in the Illinois Country and may have been exaggerated. The struggles to eke out a living from the unforgiving environment of the American Bottom, coupled with the shock of the 1811-1812 earthquakes, may have finally convinced Fr. Guillet that the mission at Notre Dame de Bon Secours was doomed to failure. In 1813, the Trappists gave up their effort, abandoned the monastery, and returned to Europe." While it would be speculation to suggest that the earthquake drove Fr. Guillet and the other Trappist monks away, it would be fair to conclude that the earthquake was another major factor in the decision to abandon the mission. Fr. Guillet's account of the earthquake is one of many that exist, and this account cannot be considered without attention being paid to the context. If the many accounts of the earthquake are compared, a picture of the earthquake emerges. If, however, one account of the earthquake is set in its historical context, a deeper rendering of the meaning of the event to the lives of those who lived it arises. In considering historical sources, one must always consider the context along with the source itself if an understanding of the past is to be had. The memory of the earthquakes of 1811-1812 doubtless lived on in the unrecorded memories of those who lived through it. The recorded accounts, like that of Fr. Guillet, are a small sample of the widespread experience of the event. The past, in its totality, may be unknowable. We can come to understand it, though, through what remains from it. Trappists - The order takes its name from La Trappe Abbey or La Grande Trappe, located in the French province of Normandy. A reform movement began there in 1664, in reaction to the relaxation of practices in many Cistercian monasteries. Armand Jean le Bouthillier de Rancé, originally the commendatory abbot of La Trappe, led the reform. As commendatory abbot, de Rancé was a layman who obtained income from the monastery but had no religious obligations. After a conversion of life between 1660 and 1662, de Rancé formally joined the abbey and became its regular abbot in 1663. In 1892 the reformed "Trappists" broke away from the Cistercian order and formed an independent monastic order with the approval of the Pope.